HN play Quảng Nam in early V.League "final"
HÀ NỘI — The match between Hà Nội and Quảng Nam tomorrow is being called the "final" of the national football premier league as the winner has a good chance of taking home the seasonal trophy. 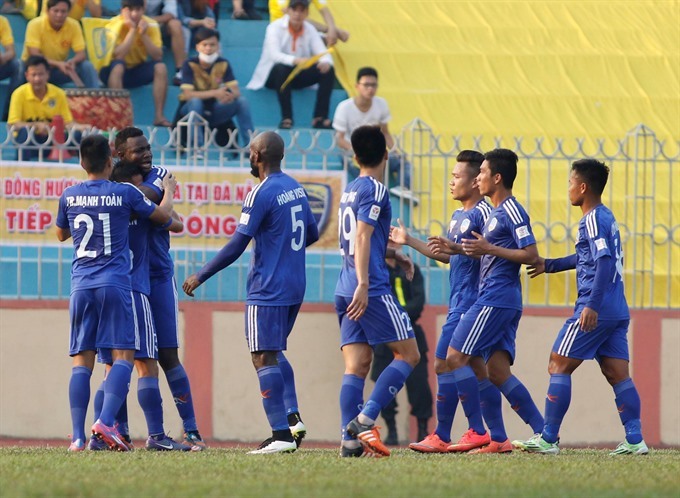 Visitors Quảng Nam are on top of the table with 45 points. Hosts and defending champions Hà Nội, with three points less, are second. Tomorrow’s match is of the 25th round of the 26-round tournament. In case they win the match, Quảng Nam will be certain of winning their first ever V.League title, irrespective of the results of the last round. If Hà Nội win three points, they will also have 45 points, the same as Quảng Nam, and will replace them at the No. 1 position, and then the champion would be decided in the last round. Quảng Nam coach Nguyễn Văn Phúc has, therefore, set a target of winning at least one point from the match at Hàng Đẫy Stadium. One point will help Quảng Nam maintain their lead following the penultimate round. Quảng Nam do not have strong back-up. They have no well-known players except for captain Đinh Thanh Trung, a member of the national team. They targeted a place in the top six this season, performed well and are vying for one-two position now. In the upcoming match, however, Phúc will not have midfielder Phan Thanh Hưng, who is suffering from a knee ligament injury. Left-wing defender Văn Học also failed to make the team, sidelined because of the yellow cards from previous games. “Although Hà Nội are always a difficult rival for Quảng Nam, we still want to get at least one point here, so that we are closer to the championship title,” Phúc, who arrived in Hà Nội three days ago so that his players could become familiar with the weather and terrain, said. Captain Trung is also cautious while talking about the game. “Hà Nội are expert in short balls. The team have high-quality players who can control the match very well. Playing on home turf is also one of their advantages. It will not be an easy match for us,” he said. Coach Chu Đình Nghiêm of Hà Nội also appreciated his rival. Nghiêm said it would unwise to look down on Quảng Nam this time. They were displaying their best performance and an exciting spirit. Despite being the hosts, the coach admitted he was worried because Quảng Nam played very well on away ground. In the first leg match on January 13, Quảng Nam beat Hà Nội 2-1. Due to its importance, Thai referee Pummarin Khamruen has been invited to judge the match. Khamruen earlier refereed matches of the International U19 Tournament in Nha Trang in April. He also refereed friendly matches between U23 Việt Nam and U20 Argentina in May.